The Summit County Sheriff’s Office is using a UTV with special snow tracks to speed across the snow and rescue people quicker than before. 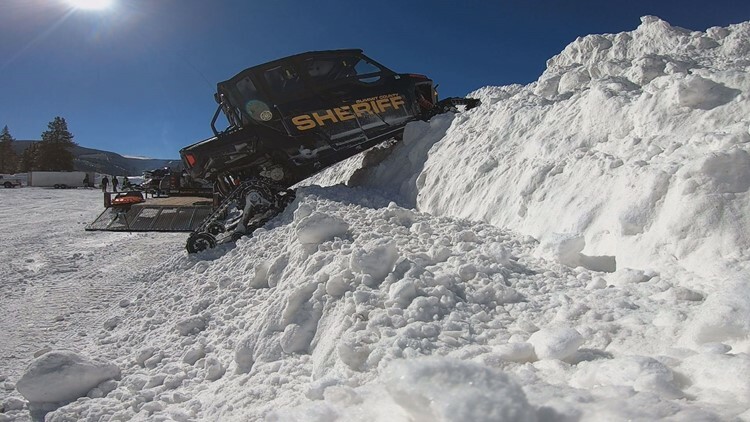 SUMMIT COUNTY, Colo. — The Summit County Sheriff's Office has a new tool to help them rescue people faster in snowy conditions this year. They're using a utility vehicle (UTV) that has special snow tracks attached that allow it to speed across the snow. Rescuers can use the vehicle to get to people in snowy conditions much faster than they could in the past. The Sheriff's Office rolled out their new ride during one of the biggest snow years on record. Ski areas across Colorado said this March has been the snowiest on record, with some places seeing more than 7 feet of snow. “We [timed] it perfectly,” said Summit County Sheriff's Office Special Operations Technician SJ Hamit. In the past, the department had to use a snowcat to roll into the backcountry. It worked, but was slow, and it took more time to load and unload in emergencies. This winter, the department took a different approach. They took the wheels off a four-seat UTV and replaced them with snow tracks. That allows rescue teams to get into the backcountry a lot quicker. “It’s a little peppier than the snowcat was, and it’s more likely to get deployed because the snowcat was so much more cumbersome,” Hamit said. The snow track UTV can be unloaded in about one minute and runs at much faster speeds. It's also heated so rescue teams can stay warm as they race to save people. “Having four seats gives us the ability to take more people into the field or bring out more victims from a search and rescue,” Hamit said. It’s already been on several rescue missions, and in this big snow year, will likely see more action. Even when the snow melts into mud, the tracks will be crucial in rescue missions, and come summer, the wheels can be put back on.